NBC Presentation —The presentation is incredible and unlike anything we’ve seen not just in the NHL series, but sports games in general. Real-life footage of the home city to introduce the game is just part of NBC’s broadcast treatment that ranges from the graphics to the great NHL on NBC theme. I was shocked by how good Mike “Doc” Emrick and Eddie Olczyk in the flesh looked as opposed to what could have been an in-game character rendering of the duo. I actually got chills similar to the ones I would get when I was about to watch a heated game on Wednesday Night Rivalry or NHL on NBC. The discussions were on point and the arena backdrop was breathtaking. Authentic Arenas — Speaking on the arenas, they’re spot on. From the rafters to the rink, everything is perfect and for the first time makes me feel like I’m distinctly in each NHL arena. To add to that authenticity, I’m happy to learn that each team has their own authentic goal horns in the game. However, I didn’t hear the authentic goal songs, which in my opinion is a disappointing exclusion. Crowd — The crowd is the best I’ve seen so far in a sports game. Some will be dressed up while others will bring some creative and amusing signs. I think my personal favorite, though, is that the cameras will show fans of the away team celebrating and rubbing it in the face of the home fans when the away team puts the biscuit in the basket. Layered Equipment — When the cameras focused on the players, their jerseys could be seen waving abut free from the models they were once stuck to. While it’s nice to see the sweaters move to give that sense of realism, it seems a bit too played up for the game. Sometimes players who are barely moving have their jerseys flowing far more than they should. It’s something I hope will be tuned down in a couple weeks or that there’s an option to do so manually. Commentary — Though Doc and Edzo’s introduction segments are great, I’m a bit mixed on the commentary in the game. While it’s leaps and bounds better than the previous team of Gary Thorne and Bill Clement, it still doesn’t match the fast pace of the game. Doc’s lines just can’t keep up with action, which proves to me that it’s just that hard to implement a commentary system on the design side to match how quickly everything is happening. But despite that, the commentary is still enjoyable and Doc and Edzo have great chatter in-between the play. I do, however, wish that the videos showed more high-pressure, high-excitement moments in a game to showcase the different levels of intensity in the commentary that EA Vancouver claims was recorded. Camera Angle — The videos also gave us the debut of new overhead camera angles, all of which made the game feel more intimate than in previous installments. I certainly wouldn’t have any objections to any of them being a new default angle. Puck Physics — Though not as obvious as the visual upgrades, the videos did show how the puck will react more realistically than before. No longer does it seem to stick to players or goalies as much as it used to and will bounce in more lifelike ways when dumped into the corners. The videos also gave a great example of how goals will now bounce and squeak by goaltenders, as Matt Nieto of the San Jose Sharks just got a backhand shot off and under the arm of Toronto Maple Leafs goaltender Jonathan Bernier. Collision Physics — With a few great pileups, NHL 15‘s improved player physics were shown off in all its glory. Though some of the hits and one teammate-on-teammate bump seemed to be a bit over-reactive, it’s great to see players bowling over one another when down on the ice or when it’s a teammate. It brings the NHL franchise that much closer to the product you see on the ice at least 82 times a year for each team. 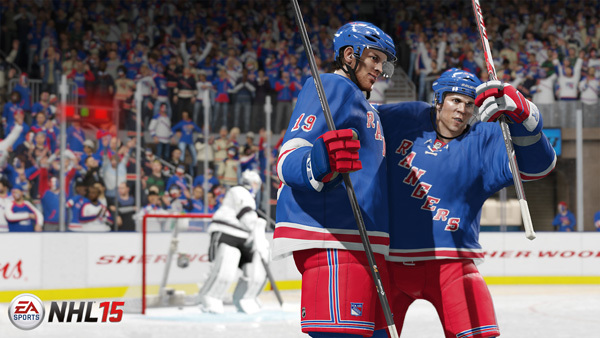 Skill Stick — The second gameplay video showed off the new skill stick coming to NHL 15. Though I can’t judge what it’ll be like until I get the game in my hands, it certainly looks like an improvement over what’s been there in the past. It looks like players will have much more control on what to do with the puck and how to get around opposing players and/or deke goaltenders out of their skates. As someone who has a hard time perfecting — or even averaging — the more free-form version of the skill stick, I’m hoping that’s actually the case. Group Celebrations — Lastly, there were a couple of glimpses to the group goal celebrations. Nothing fancy, as it was all just one or two teammates coming in to give the goal scorer an embrace and tap on the helmet, but it’s still another strive in the right direction and we could see them add even more when they happen in big-time moments. So that’s everything I caught that the videos showcased. If you have any thoughts on what was there or noticed something I didn’t, let me know in the comments.